Hi, everyone! Heather P. here today with a fall-themed card I created using one of my favorite sets, The Big, the Bold and Seasons, and a somewhat unusual color combo. I am obsessed with gray these days, and I love that it pairs up nicely with the patterned papers I selected for today's card. Rust, gray, cream and aqua aren't colors that I would normally use together, but I really like how they turned out! To create my card, I started by cutting two pieces of patterned paper, and used a 1/4" corner rounder on two of the edges on each piece. I wrapped the plaid pattern paper with jute twine, and adhered it to the card base with pop dots. Next, I stamped the flourish pattern paper with Autumn in versamark ink, then heat embossed with platinum powder before adhering it to the card front with pop dots. I then cut a 1/8" strip of light gray card stock, and adhered it to the card front (making sure to slide it underneath the twine) before covering it with stickles. I tied the jute twine and secured with a double bow. To finish up, I embellished with aqua buttons. Well, that wraps it up for me today, but be sure to stop by again tomorrow for more fabulousness with Leading Lady Lyndal Higgins! WOW! I LOVE this card. beautiful card!! gorgeous embellishments!! nice papers.. love the "autumn"
Gorgeous card Heather! Love the paper and the way you finished it out! What a great card Heather! I love everything about it! 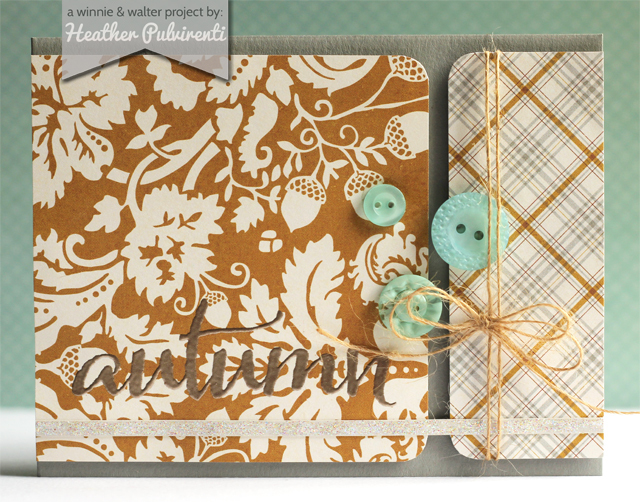 Love the heat-embossed Autumn, Heather! 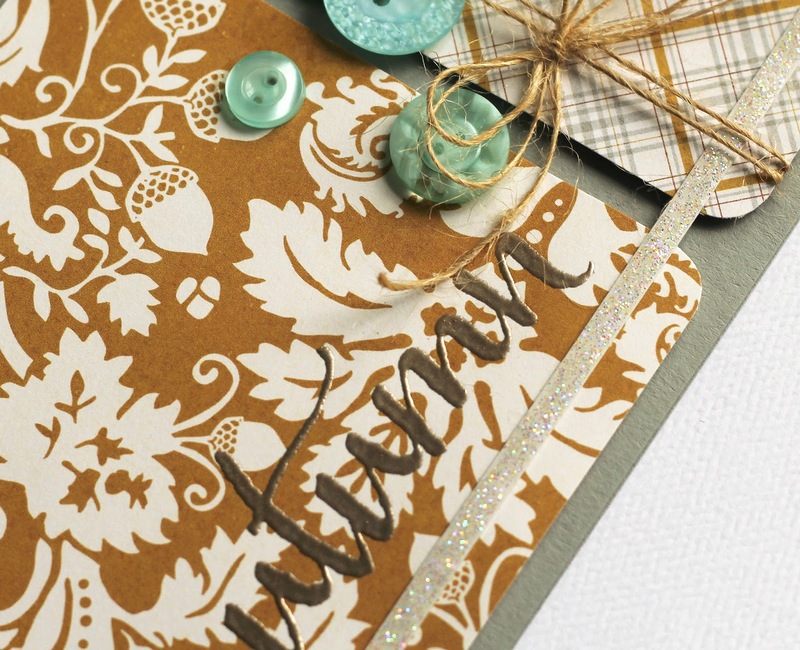 The grey and aqua look fabulous with autumnal colours - I love this colour combo you've created! This colour combo and card are just gorgeous Heather!!! LOVE the design and colors, LOVE the strip of sparkle and embossed sentiment too!!! Very pretty card Heather...love the design and colours.